Empower decision-makers to answer questions and make faster decisions. F9 Viewer is for decision-makers who want to do more than look at static reports or to rely on the finance team to provide reports. It allows managers to get detailed information and make better informed strategic decisions. They can easily filter, recalculate, and drill down into financial balances and transactions and even run reports on their own. The finance team who until now were tasked to run reports, distribute reports and assist decision-makers in analyzing data can just publish master-template F9 Viewer reports. The decision-makers are empowered to answer their own questions and easily interrogate the data. You will never have to worry about building F9 reports. Stay focused on your latest dynamic results. Change F9 parameters and quickly recalculate formulas across any range, worksheet, or workbook. Drill into any F9 Viewer cell-based formula and analyze its individual balances and transactions. F9 Viewer does all of this through a dynamic link to financial data, ensuring that all numbers are timely, consistent, and complete. 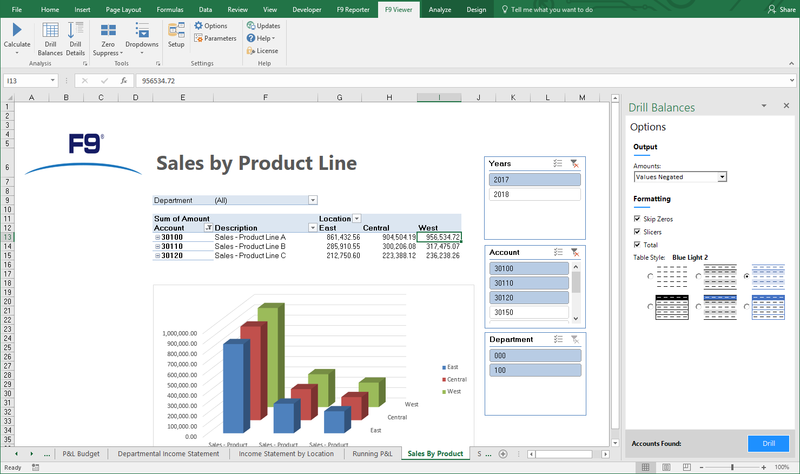 You will never have to manually create and customize your spreadsheets again. With a few simple steps you will be able to create the reports you need quickly and easily. You can manipulate your reports and refresh simply by clicking the F9 key on your keyboard. Being dynamically linked to your data, ensuring that all numbers are timely, consistent, and complete. 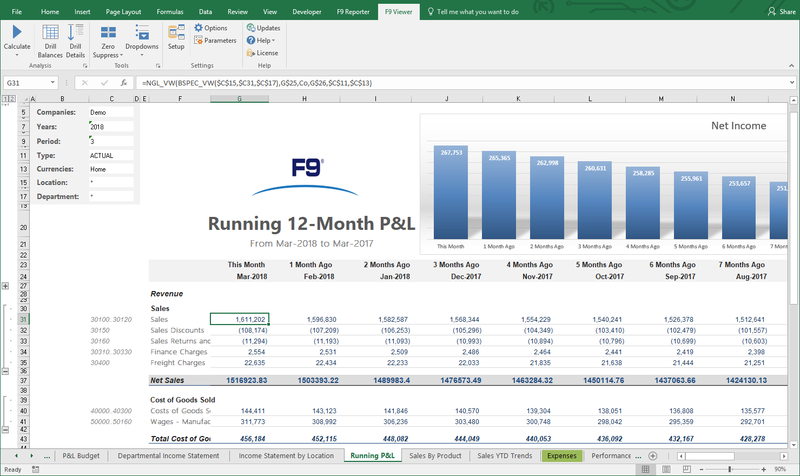 F9 employs a combination of financial based formulas in Microsoft Excel, allowing real-time financial data to be formatted into any financial report within the powerful environment of the spreadsheet. With F9 you can ensure you always get the critical information to manage your business successfully. With F9, we can roll out new reports quickly and easily. 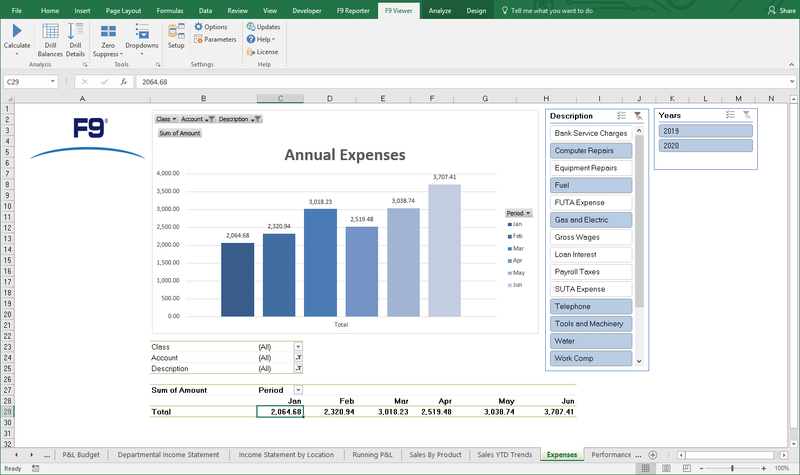 Because it 'lives' in Excel, it has made our annual audit much easier.